U Beats is a pocket music station for creating unique melodies from scratch. No more boring beat pads - choose your style and play with sound effect to create studio-quality tracks. • Save, share and WOW your listeners! Start recording now and share your music with friends and the world. Post your music tracks with #ubeats hashtag - we love to hear your cool tunes! 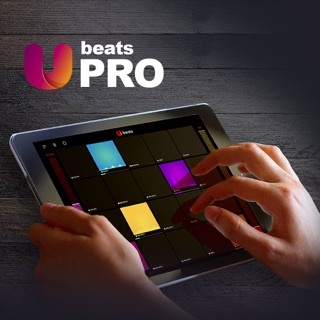 - Thanks for using U Beats app! Good. Not great, nor the best. Here's the thing about this app, it's great for making beats on the go and making music from scratch. But, I find it hard to memorize certain patterns while in the experimenting and best making process where the original gets lost in what I try to improvise with. I think the play button should have more functions, or maybe something like editing and automation, and when you press play, the loops you place together are in a certain order you put them in, and in the certain time they stop or start. I also think you should be able to use multiple pads at once. Maybe pick out the instruments you use for one pad and incorporate it into one new, big pad scheme. Of course, if you do take these suggestions, I strongly suggest to put them in the membership, so that more people (like me), are willing to buy a membership. Thank you for your time. I have been trying to purchase the year version and have been getting charged 7.99 a week for 3 months now. I tried to cancel and all it did was subribe me again. Really nice software but the programmers aren’t releases new sets like they say and I’ve paid well over enough money to have this for 2 years and I was getting double billed at one point and pretty sure that’s about to happen again. You had me in the beginning but I’m not sure about this program. Hello. Thank you very much for the feedback. We hope you will become great music producer! :) Time to time we publish free professional content. Stay with us and enjoy!